Post-tensioning, or PT, has become increasingly popular over the past 30 years or so as the technology has been perfected. At one time there were problems with corrosion of the cables, especially in deicing-salt-laden parking structures, but better materials and construction methods (plus good training and certification programs) have eliminated most problems. 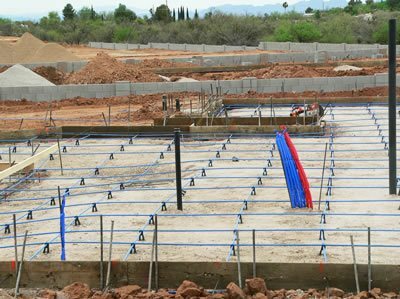 The applications for post-tensioning are almost endless, but what holds it back is the lack of experience among designers and builders. 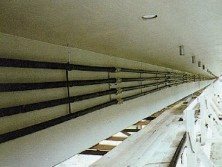 In an article in Structure magazine (PDF), Gerard Feldman noted that "Most engineers have only a cursory overview of post tensioning in college...this unfamiliarity creates a bias towards conventional reinforced concrete structures." Slabs on ground: Today, PT is used extensively for slabs on grade where soils are likely to move (expansive soils)-especially in the American southwest. Jim Rogers, editor and publisher of Post Tension Magazine, says that until housing construction ground to a halt last year, about half of all post-tensioning work was slabs-on-ground for homes. Residential Concrete magazine had a good review of this in its September 2006 issue. Another good application for PT slabs is producing crack-free tennis courts. A recently developed application of PT is external post-tensioning for strengthening of existing structures, especially as an upgrade to resist seismic forces. The best review of this is available from the International Concrete Repair Institute, "Guideline for the Selection of Strengthening Systems for Concrete Structures." Bridge designers have used PT both for cast-in-place concrete and for precast segmental construction. PT allows longer spans and keeps cracks tight. 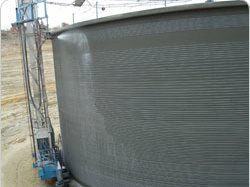 Concrete water tanks are often post-tensioned to reduce crack width and leakage. The companies that make prestressed concrete tanks are Crom, DYK, Natgun, and Preload. Masonry walls can be post-tensioned-this is usually done with a solid steel bar fastened to the foundation and stressed with a nut at the wall's top. A good article on PT for masonry is available on Masonry Construction magazine. One interesting application is for a concrete countertop that needed to span 6 feet and carry a heavy load.